Zara Phillips kept her nerve to claim individual gold on Toytown in the three-day eventing competition at the World Equestrian Games in Germany. The 25-year-old Briton had moved up from fifth to first thanks to a faultless performance in Saturday's cross-country section in Aachen. 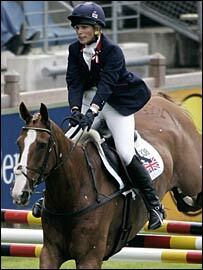 Then in Sunday's show-jumping category, Phillips showed her class to add the World title to her European crown. Germany comfortably won team gold as Britain came second ahead of Australia. Australia's Clayton Fredericks took the individual silver medal behind Phillips, with America's Amy Tryon taking bronze. Phillips negotiated the showjumping course with only one mistake, when Toytown caught a rail inside the penultimate fence, the treble. Phillips told BBC Five Live: "It's unbelievable, a fantastic result. It's great we got a medal for the team as well. "The thing that put pressure on me was that I didn't hear the bell so I didn't get to the start on time. "I looked up at the end and just rushed it but luckily I had a fence and a bit in hand." Following her win, Phillips is now 3/1 second favourite to win the BBC's Sports Personality of the Year Award. Her mother, the Princess Royal, was awarded the honour in 1971 after becoming European champion that year. Tennis player Andrew Murray is the current favourite with bookmakers WIlliam Hill to land the prize in 2006.